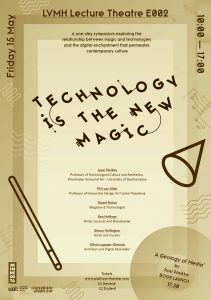 Technology is the New Magic is a one-day symposium I organized and chaired to explore the relationship between magic and technologies and the digital enchantment that permeates contemporary culture. Magic and technology are inextricably linked. Technology enchants us. Even more so in its current digital form. We are under a collective spell, or are we? How do we make sense of the omnipresence of digital technologies? What are the design narratives manifest in our constant interaction with digital devices? 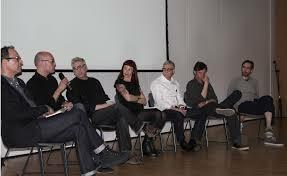 Speakers: Jussi Parikka Professor of Technological Culture and Aesthetics, Winchester School of Art University of Southampton; Stuart Nolan Magician & Technologist; Phil Van Allen Professor of Interaction Design ArtCenter Pasadena; Ken Hollings Writer Lecturer & Broadcaster; Simon Hollington Artist & Curator; Oliviu Lugojan-Ghenciu Architect and Digital Storyteller. Read here my introduction and welcome note. Read more about the speakers and their talks here.